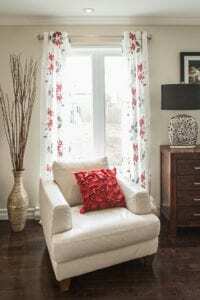 Hang drapery well above – not directly on – the window frame, which will give the illusion of a taller window. Halfway between the top of the frame and the ceiling/crown moulding is the general rule of thumb, but use your discretion if you’d like to go for a bit more height. Just ensure the rod is at least 2-3” below the ceiling to create the necessary distinction. Also, be sure to account for the added height when measuring for panel length. Don’t use a tension rod to squeeze your panels inside the window frame. Blinds are a better option for the inside frame, and an outside rod will give you the option to incorporate both blinds and curtains into you décor, a great option for added warmth and texture. Extend the rod on either side of the window, so that the panels hang flush with (just barely covering) the window trim. With this trick, when the panels are open, the full window itself will be on display, allowing for more light and an open view. When closed, drapery looks and billows best when full, as opposed to flattened against the window pane. You’ll need at least 2-3 times more fabric width than the actual window width to achieve an appropriate level of fullness and dimension. For added drama, add 6-8” to the rod-to-floor measurement so the fabric will pool nicely on the floor. For a more modern effect, have the hem stop just a ½” off the floor. Of course, safety comes first in any solid decor plan. For homes with electric heaters directly beneath windows, which is common, fire standards require 3” from the top of the heater to the end of the drapery. When it comes to your home, personal preferences trump any official rule – just keep in mind the true potential that your drapery panels have to improve your entire room, not just your privacy. Visit Bev and Wade Matthews at their fully revamped Paint Shop in Grand Bank.